My first outing since before Christmas (you can't count a trip to the doctors) and the OH woke me early to catch the sunshine before the threatened downpour (still hasn't arrived - now 2pm). Having just about exhausted the photos we took on our trips around Barnsley in October and November I had asked him if we could survey a few more villages if the weather was fine. There was frost on the ground and the car windows were iced up, but the sun was bright so we didn't expect the skating rink we found at the first stop, Silkstone. I suppose it's higher up and more exposed than Cudworth, but honestly I thought I was a goner when I took a couple of steps on to the paved area in front of the War Memorial near the church. Black ice, invisible ice more like. Luckily I'm still a bit doddery after my chest infection and other stuff so I was hanging onto the OH's arm at the time. Saved me! That's the OH keeping cautiously well back on the tarmac'd bit to take his photos. A lot of mine have come out fuzzy today, as I'm still a bit too tired to hold the camera steady. Ah, well, his will be OK I'm sure. The thing about an adventure like this on a Sunday is that the churches are all tantalisingly open, lights on, organ playing, and lots of cars parked in all the available spaces. We couldn't hang around though as the sunny window was only forecast to last a hour or so. Onwards to Hoylandswaine. 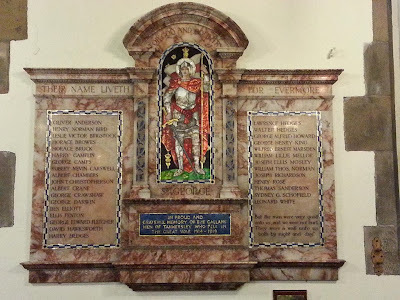 Now I do have photos of these memorials that I've found on the web, but as I've mentioned before it's nicer to have your own and mostly the photos I've seen are just long shots, not close ups of the names, which I need to do the transcriptions. The sun couldn't have been in a worse place for this one, but I suppose it makes for an atmospheric photo. 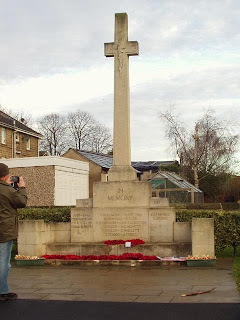 The memorial is opposite the Rose and Crown pub - the OH was making mental notes all morning about which pubs he needs to visit to check on real ale and all the other things CAMRA branches need to know. It was turning into a dual purpose trip again! My plan said Penistone next, but the OH was in the mood for narrow roads and obscure places. I often say I don't know how Barnsley joins together, despite living here for more than ten years now, there again in twenty years in Sheffield there were places (and pubs) I never visited. We detoured off to Ingbirchworth, the OH drove past the Fountain pub and made some comment about campsites ... it all goes in the guide apparently. 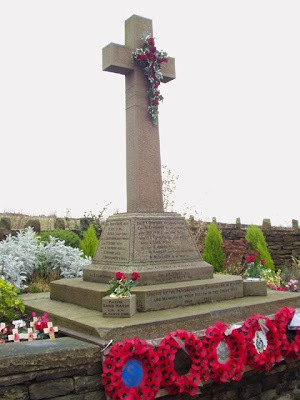 Eventually after a very close view of some wind turbines we popped out in Millhouse Green just above Thurlstone - which hadn't been on my list as there's nothing on the Imperial War Museum's online War Memorial Archive for the village. Ha! Just goes to show, always check yourself. After a pootle around some backstreets and a check of the churchyard I just spotted the top of this as we came down the road behind. It's brand new, unveiled on 5th May 2013 after a local fundraising exercise over the past couple of years. There are no names on it but the style and decoration are stunning, a shame some vandal has knocked a chip off the plinth already. 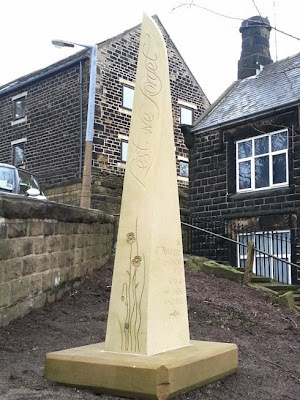 There's some information about it here on the sculptor's website, and a piece on Penistone FM about the project and the plans for the unveiling. The light was going now and you don't get the full effect of the twist and slope of the memorial, so I would recommend you do take a look on the sculptor's page I've linked above. Back into the car and on to Penistone itself - which is one-way these days; I think we drove past the church three times trying to get to a side street where we could park! The memorial here is just outside the church and is another that I did have a photo of and even a list of names from the Genuki website, but I wanted my own photos. 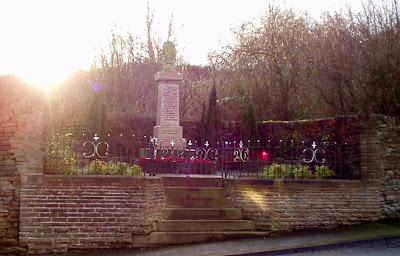 I remember reading a newspaper piece about the planning of the memorial in Penistone in the Barnsley Archives before Christmas. The committee erected a temporary structure to make sure people liked the design - what a good idea! 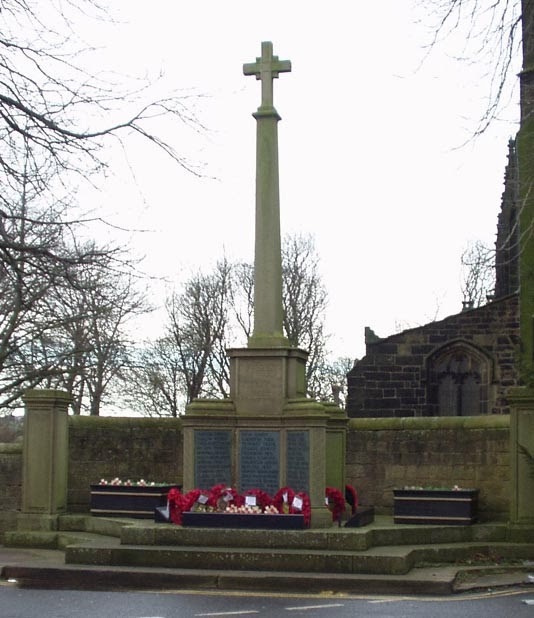 The metal plaques at the front appear to be for the First World War soldiers and the ones to the sides for the Second World War, but it wasn't absolutely clear - I'll do a bit of cross checking on the Commonwealth War Graves Commission site when I come to transcribe this one. My final planned stop was Thurgoland, a place I think I've passed through on lots of occasions but never stopped. There is a pub, but I don't know whether it's one the OH approves of or not! We parked up by the church, lights on, organ playing, again very tempting, but I'm not the kind of person who gate crashes church services. The memorial wasn't visible, so taking the OH's arm once more, as I was really beginning to run out of zing, we took a walk down the street as he was sure he'd seen the memorial on a street corner at some point. Yes, it was opposite the Green Dragon pub! This was the first memorial today where I'd noticed up to date additions. The little stone cube/vase on the near corner commemorates a David Marsh who fell in Afghanistan in 2008. On the opposite corner is a similar stone cube for a locally linked VC winner Eugene Esmonde. According to Wikipedia he was born in Thurgoland although his family were from Ireland. I'm not sure what the rules are for claiming a VC for your area, but it does seem fair that only one place can claim a person, otherwise the government would be putting those new paving stones all over the place, wherever someone lived for a few years, just like blue plaques! The OH now suggested we went home via Tankersley as it was on the way. I explained that as far as I knew the only memorial in Tankersley was actually in the church itself, but I wasn't adverse to having a look just in case. Turned out to be the luckiest detour of the day! As we pulled up outside the church, which is out on a limb, not in the village of Tankersley itself, there were people getting into their cars. The Sunday service had just turned out. You've never seen me dodder so fast! I was out of the car and across the road before the OH had even turned the engine off. He caught me up and gave me an arm as I dashed (OK, that's a bit of an exaggeration) towards the church gate. The lights were on and the organ was playing but the door was open and people were still coming out. We nipped in and I asked the first people I saw if it was alright to take some pictures. They were very happy and even explained that the book displayed in a glass case below the memorial plaque was a one man per page potted biography of each name on the memorial. I had seen a mention of this book in the 1921 newspaper cutting from the Barnsley Chronicle reporting on the unveiling of the plaque, it's wonderful that it has survived all these years. Isn't the plaque lovely? Previously I'd only seen a fuzzy picture on the church's website, but seeing it for real brought a tear to my eye. My pictures are not very good (it was a bit dark), but the one above is one of the OH's and it has come out very nicely. The second world war names were carved around the cover to the font, devious to photograph, but what an unusual idea. A second check around the church also brought the discovery of a brass plate commemorating four servicemen buried in the churchyard and a plaque just below the main one with names of men who were not parishioners, but who were 'closely connected to the church', that will bear some investigation. Thanks for that information Elizabeth, I wonder why the radio snip I found mentioned May for the unveiling - was that a different occasion? I did link to the sculptor's website in the post as I was very impressed with the design. And glad to hear the chip was NOT vandalism - my faith in human nature is restored!